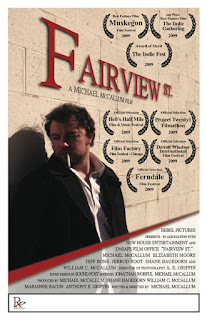 Fairview St., written and directed by Michael McCallum, is a neo-noir drama set around Lansing, MI. The film follows James Winton (M. McCallum, who also stars) after his release from prison and his attempts to assimilate back into civilian life. However, Wintson’s attempts to start over are hindered by his old partner in crime Bobby Stone (Jerrod Root), who wants to lure him back to the streets, and a detective (Jeff Bone) whose vendetta makes him determined to put Winton back in jail. As this is a true independent film with no ties to the major studios, those expecting a high gloss Hollywood picture will be disappointed. That said, Fairview St. provides something that no amount of CGI can – characters the audience cares about. While Hollywood is convinced I want to see crap pop out at me in 3D, it’s refreshing to see such character driven films as this. Each main character in Fairview St. is allowed joy, pain and everything in between. McCallum turns in a strong performance as Winton, and the supporting cast does an incredible job amplifying his struggle, particularly in the reactions of his family whose dilemmas resonate strongly. We know Winton wants to do right, but his family doesn’t deserve the heartbreak he’s caused and every frame they’re in celebrates his return and while remaining fearful of losing him again. Winton’s family unit is comprised of his Father (played by Michael’s real life father, William C. McCallum) and his wife, Natalie (Elizabeth Moore) and they all share fantastically drawn and “real” scenes together. Some of the scenes between the two McCallum’s in particular must have been emotionally trying due to their "real life" relationship, but the audience is all the more indebted to them for the resulting on screen relationship. The absolute knockout performance, however, was from Jerrod Root as Bobby Stone, who steals every scene he’s in. Root plays the motor mouth bad boy Bobby with the right amount of charisma, darkly comedic relief, and dangerous unpredictability that make us love watching him – but hope we never meet him in real life. The film is constructed in black and white, and uses the “fade” heavily, which felt like a nice throwback to both the silent and classic studio era (it would have been fun to see the classic iris show up, which has all but disappeared). Cinematography is strong, with some very cool shot compositions. The film also uses “live” ambient sound in the background of shooting locals which add a nice realism to the film, and is a big contributor to the lo-fi aesthetic that this film embodies. Naturally, being a DIY/lo-fi film, there is bound to be few technical gaffes and sure a few lines of dialog could have been tightened up, etc. but in a way, they add to the overall charm of the film. If you have the opportunity to see this movie, I can’t recommend it enough. I had an absolute blast watching it, and can't imagine any movie lover not finding something to enjoy.